Three years ago, Sarah and her husband, Drew, bought a 1902 fixer upper in Seattle. While they were impressed with the size of the kitchen, the finishes and layout left a lot to be desired. The red walls, orangey oak cabinets, pink countertops and peeling linoleum floor had to go, but the new homeowners didn’t have resources for a complete overhaul. 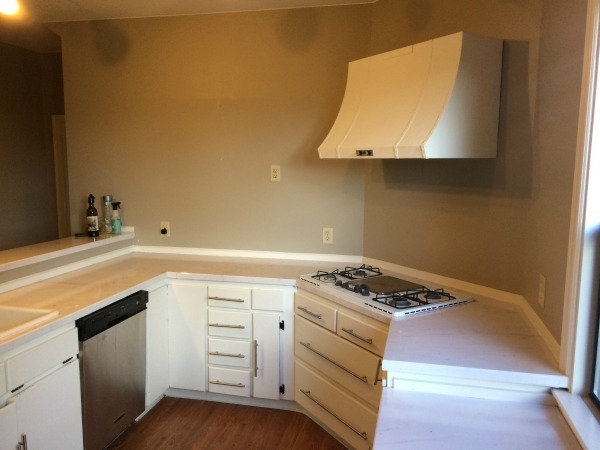 Over the course of a week, they painted the walls and cabinets, added inexpensive hardware, applied marble contact paper to the countertops and installed wood lookalike peel-and-stick flooring. 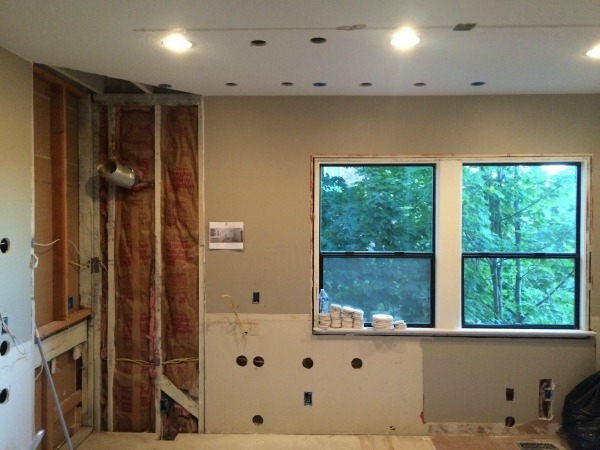 They affectionately referred to the mini makeover as their “stick on” kitchen. It bought them some time to live in the space and figure out what did (big windows!) and didn’t (angled stovetop + hood, peninsula) work. Two years later, they tackled a full-on remodel and utilized IKEA cabinet frames. I asked Sarah several questions about the project. See her answers and the incredible results below! We bought the cabinets and hinges from IKEA. We sourced all other items elsewhere. There were three things that sold us on IKEA: 1) The hinges are really high quality. Every time I go to IKEA I just want to open and close all the drawers. 2) All of the accessories fit perfectly! 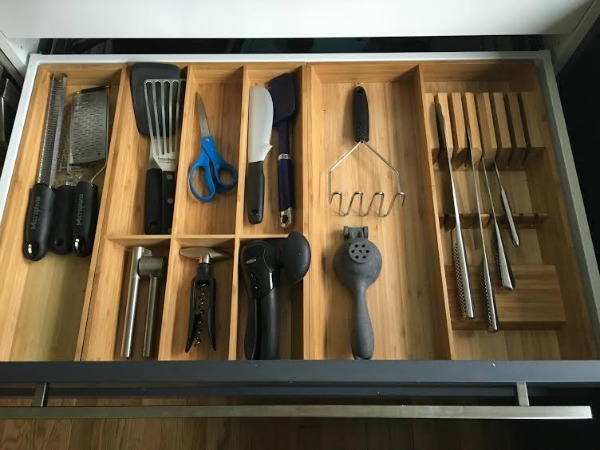 I know that seems minor, but I love that our utensil divider doesn’t jostle around in the drawer. The same goes for our pantry organizers. Once the cabinets are in, it’s so much easier to find/make the perfect place for everything. 3) We read so many great reviews. It seemed everyone who had installed an IKEA kitchen was happy with their decision. Most complaints were about the installation process, but we had planned to outsource that anyway. We hired a designer to reconfigure the space and make sure all measurements were correct. She helped us determine the size of the island and ensured adequate space for traffic flow. (If I would’ve designed it alone, the island would’ve been way too big!) We chose all the finishes and fixtures ourselves. We wanted a kitchen that felt clean and modern but not totally out of place in our 1902 house. 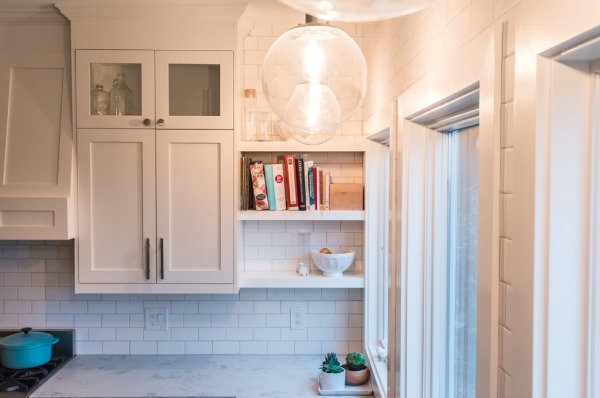 The shaker doors are timeless, but the way we used the subway tile to cover entire walls immediately spruced up the space. We hired a contractor, NW Homeworks, who specializes in IKEA installations. They put together our shopping list and assembled and installed everything. We customized almost everything! The doors and drawer fronts are custom. We bought the sink, appliances, countertops and hardware from non-IKEA sources as well. 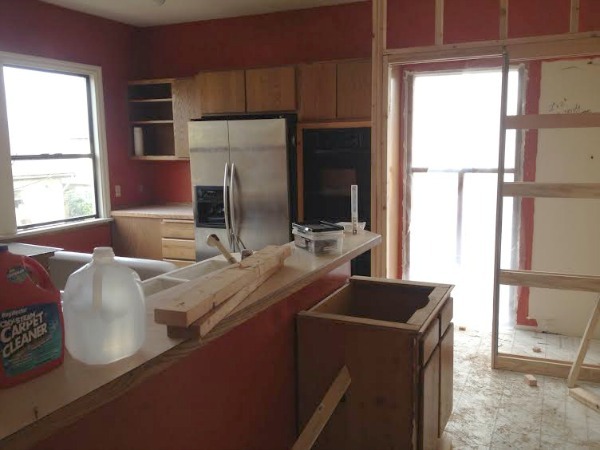 When we bought our home, I wanted to remodel on day one, but I’m glad we waited. Two years later, we had a very specific idea of what we wanted. Our designer helped with the new layout, but we selected every detail of the design. It took us about a month to complete the design. We went back and forth several times on the configuration of the room. We moved the sink, and once I wasn’t locked in by plumbing/gas lines, I wanted to try everything! 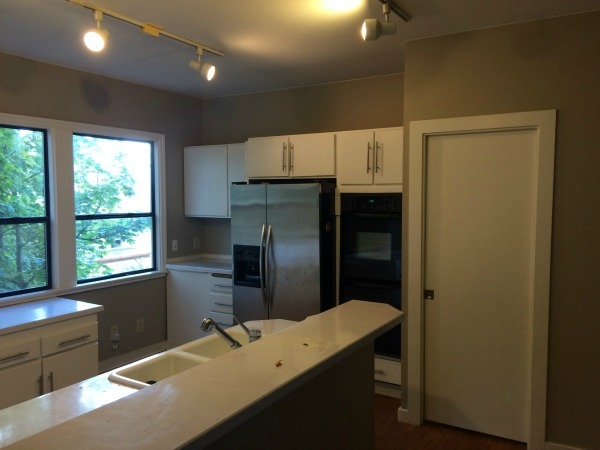 From demo to completion, it took nine weeks. We’ve lived with our new kitchen for six months, and, so far, we love it! It’s beautiful to come home to at the end of each day, and it’s just so functional. I know where everything is which makes cooking and cleaning up so much easier and quicker. It’s super efficient. I love the new layout. We reconfigured the whole space which really made it more open and user-friendly. Originally, we were going to keep the same configuration because it was cheaper, but we realized that, once we got the layout right, it would be easy to update the space over time. If we ever decide to repaint the cabinets or replace the countertops, we can. By far, spending extra to get the layout right was the biggest and best decision we made. The only thing I would do differently is nix the upper cabinet lighting. During the design process, I thought warm light streaming through the glass front cabinets would be so cozy, but I seldom remember to turn them on! I think I’ve turned them on twice. I noticed there’s a microwave and wine fridge in the island. Would you mind sharing your thoughts on (the placement of) those appliances? I hate the way microwaves look, but I’ve always missed their usefulness when we’ve gone without one. Putting the microwave in the island solved the eyesore problem. For the most part, it’s been great. Initially, it was annoying because the buttons aren’t at eye level, but, I learned the layout of the keypad and no longer have to squat down to look at the buttons and it’s totally fine. We could probably do without the wine fridge, mostly because we weren’t able to find a great mid-grade option. There are cheap ones that are really loud and quiet ones that cost thousands but, at least in the size we needed, they’re weren’t any good quiet, affordable options. I drink sparkling water like it’s my job. It’s been nice for that, but it’s one of the least used items in the kitchen. What’s behind the black pocket door? The short answer: A powder room. The long answer: The backstory on our house is actually pretty crazy. The Seattle housing market is nuts, especially if you are a first-time home buyer and have no idea what you’re doing. Prior to buying our house, we lived in a small apartment (only 600 square feet!) in Capitol Hill. We loved the neighborhood and wanted to stay close, but we were basically stuck choosing between small apartments or million dollar houses. When we came across affordable family homes, they would sell within 48 hours for well above asking price. Then our amazing realtor introduced us to a builder who had just bought the old house we live in now. The house was on a sizable lot, and the builder’s plan was to move it forward and build three townhouses in the backyard. The previous owners had added an addition to the back that would have to be removed to make room for the new townhouses. 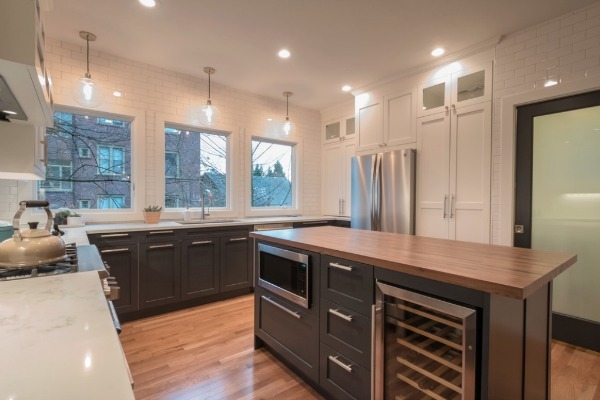 He offered us the house and we saw it as great opportunity to live in the Capitol Hill area while still gaining square footage and not overspending. Looking back, it was an insane way to purchase a first house because it was so complicated. They literally picked up our house (with its 115-year-old chimney) moved it forward ten feet, poured a new foundation and then set the old house down on the new foundation. We would drive by when the house was in the air (for several weeks!) and just hold our breath. Thankfully, it worked out. The builder began moving the house in January, and we moved in by July. We got a new foundation out of the deal which is great for a house our age. Most old Seattle houses don’t have a bathroom on the main floor which is why the previous owners had added on to the back of the house. (The addition contained a storage room and a full bath.) Since the builder had to remove that part of the house, he added a half bathroom accessed by a pocket door so we would have a bathroom on the main floor. We can only speak for the cabinet frames, drawers and hinges, but, for those, we would highly recommend IKEA! 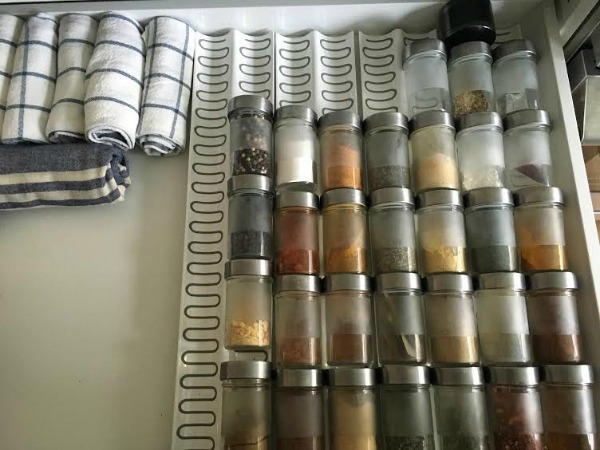 Thanks, Sarah, for sharing your kitchen! It’s beautiful. What a transformation! I think Sarah and Drew’s decision to get the floor plan right was smart and will prove to be a worthy investment in the long run. 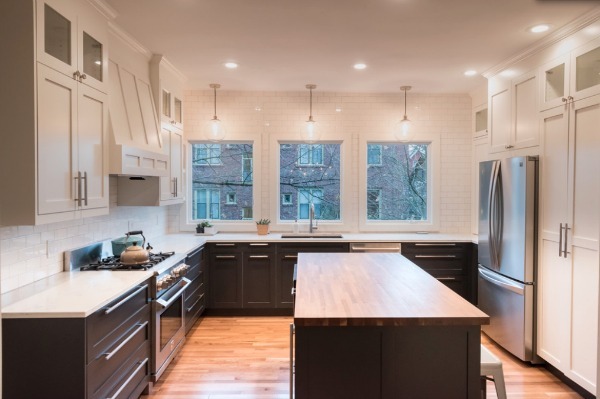 Nixing the angled stove/hood and opting for an island over a peninsula completely changed the way the space works and looks. 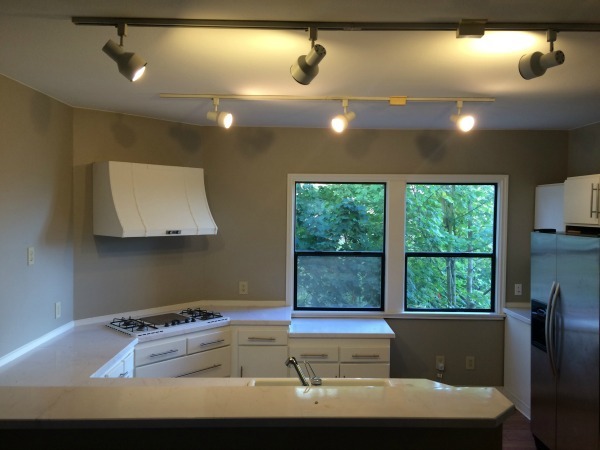 Did you notice the addition of a window to form a trio of windows above the sink area? Who wouldn’t want to wash dishes with that view?! I love all the classic material choices. 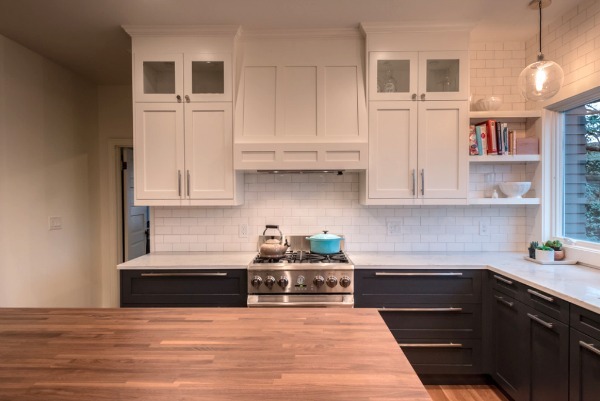 Even though it’s a tuxedo kitchen (dark lower cabinetry, white upper cabinetry), it feels timeless. My favorite design moment is the open shelving in the corner. It helps to break up all the upper cabinetry and built-in hood. Not to mention, it’s a clever spot for stashing cookbooks. Want more inspiration? You can find an entire IKEA kitchen series by clicking the See Real IKEA Kitchens button in the side bar. What’s the cost of something like this? Thanks for throwing out some numbers, Drew! That’s really helpful! Late reply here, so maybe you won’t see, but can you say who your designer was? This Seattle area girl needs a layout designer too! Thanks Drew! What a fantastic outcome! I second Jodie’s request. Drew, if you are still checking this, I would love to know who you used for design layout. 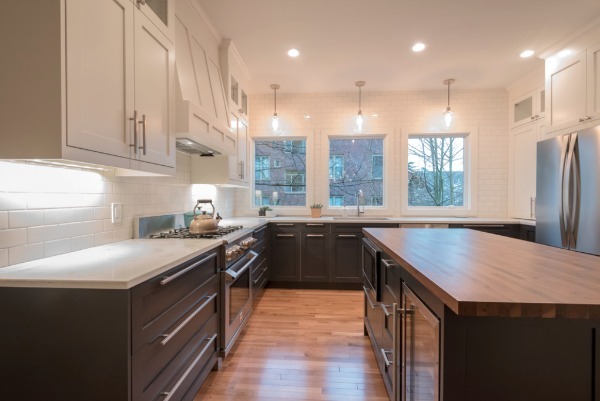 We’re look some design help for our kitchen in Seattle and I love how this turned out. Thanks! Oh my goodness! This is absolutely gorgeous!!! So glad you shared this one. Just makes me itch to do another Ikea kitchen. That story about the house hanging in the air is giving me hives. I would not have survived. Isn’t that fascinating?! Moving a house – even just 10′ – seems impossible or magical!! It’s beautiful! I’m in the middle of designing my new kitchen right now and I’m finding it fun but also crazy stressful! Beautiful job, Sarah and Drew. Thanks for sharing, Dana. Beautiful! Soooo jealous you have such a large space to work with. I’m also in Seattle and know the pain of the crazy housing market here. Can you share details on the exhaust hood/cover? We bought the hood from Costco and then our contractor did a custom installation to match the cabinets. This is absolutely gorgeous! Looks wonderful. Thanks for share this. I would love to know about the stove hood. It’s great! Any chance it’s not custom? The kitchen is really beautifully styled, no doubt. Yet, I think it looks empty. Why aren’t there any kitchen appliances? I love that you brought the upper cabinet all the way down to the cabinet in the back corner of the ‘built in cabinet wall’. I hope you use this space to store plugged in ready-to-use everyday appliances, because that would be so practical and perfect. So well done! I love everything about this kitchen…. and am especially partial to the three windows over the sink providing a great view. Thanks for sharing! I love this series. IKEA cabinets are definitely in the running once we renovate our kitchen. It makes me so sad that they don’t offer the GRIMSLOV doors in a black finish to be able to do this type of tuxedo kitchen with the SEKTION line. I just can’t get behind doing white uppers and medium wood lowers. Oh this is beautiful! I live in Seattle and have a turn of the century home with a horrible kitchen. We would love to do something like this. I’d love to know what this ended up costing. For a new project: make a deal with IKEA and print a book with all the kitchen blogs you’ve done!! What type of paint are the cabinets doors .. Satin ? Semi? I absolutely love this kitchen. Would you mind sharing who your designer was? Hi Kate. 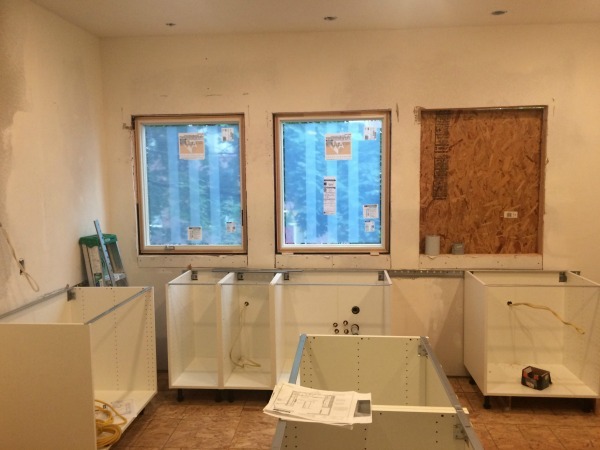 I’m the contractor for this kitchen (NW Homeworks). Sarah and Drew used our in house designer, who used to work in the IKEA kitchen department before she got her design degree. This home is just gorgeous and it seems to fit the date of the home perfectly. Beautiful design and material choices. This is a perfect example of what Ikea kitchens can be with some thought. Brilliant job!!! Just a personal thought – I love how clean the lines are in the kitchen with the microwave in a lower cabinet. It makes all the uppers perfect. I know that Dedra Doors makes Custom Ikea Doors in Portland Oregon as well. I’m designing an Ikea kitchen with Grimslöv cabinets and would love to recreate the microwave situation in this lovely kitchen, including using the same microwave. I see that it’s a countertop model. It looks like it’s sitting in a 30″ cabinet. Is it surrounded by custom-cut filler panels? Any tips on using a countertop model inside a cabinet in this way? Thanks for the post and any advice! Can you share with us the name of your designer? I’m a fellow Seattle-ite planning a kitchen reno, and am considering using Unhinged Custom Doors with IKEA cabinets… would love to get in touch with Sarah and Drew to see how they’re liking the doors a few months later! Would that be possible? Thank you!